This architect from Città di Castello was also the author of the guide entitled “Diario delle Feste che si Celebrano nelle 35 Chiese di Città di Castello, le Reliquie e i Corpi Santi che in esse si Conservano”, which was published in Todi in 1687. The sanctuary of Santa Maria di Belvedere was designed by Antonio Gabrielli and Nicolò Barbioni. 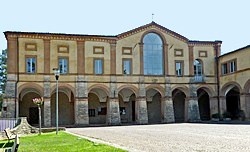 Nicolò Barbioni designed the church of San Filippo Neri for the Oratorian Fathers. ✴the Cappella del SS Sacramento (1682-85), off the right wall of the church (illustrated here). The Confraternita della Santissima Trinità rebuilt the choir of their church (Chiesa della Santissima Trinità) to a design by Nicolò Barbioni in 1682. Nicolò Barbiani built the facade and portico of San Giovanni Battista in 1687. Nicolò Barbioni designed the mock facade of Palazzo del Podestà in what is now Piazza Matteotti on what was actually the left wall of the 14th century palace.